Tatanga (also known as Tatanga the Mysterious Spaceman) is an alien invader who once conquered Sarasaland. Although he is acknowledged as an invader, in appearance he looks like a meek purple alien. During the events of Super Mario Land, Tatanga captures Princess Daisy, the princess of Sarasaland, and orders his armies to guard the land's four kingdoms. 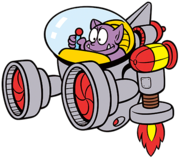 Tatanga is also the first extraterrestrial main villain to appear in the Mario franchise. The instruction manual for Super Mario Land states that Tatanga eats Torions, and when defeated in Super Mario Land 2, it is shown that he is shorter than Super Mario. Tatanga's home world and the name of his species are not revealed, though what appears to be another member of his race (albeit with hair and more pronounced mandibles) named Katsini appears as a boss in Wario's Woods. In the Mario character encyclopedia, Tatanga says, "I'm Tatanga, a Mysterious Spaceman. In 'Mario Land', I took over Sarasa Land and tried to take Princess Daisy as my queen, but Mario got in my way. This time I'm gonna do the same to him!" Tatanga is a mysterious invader from an unknown planet. He invades Sarasaland during Super Mario Land and captures Princess Daisy. Tatanga hypnotizes the inhabitants of Sarasaland, allowing him to control them. He has the most powerful of them guard the four kingdoms of Sarasaland - Birabuto Kingdom, Muda Kingdom, Easton Kingdom, and the Chai Kingdom. When Mario defeats the hypnotized creatures and liberates all the kingdoms, Tatanga and Mario engage in air combat. During the climactic battle, Tatanga fights in his spaceship, the Pagosu, while Mario fights in his airplane, the Sky Pop. Mario has to fire his missiles at Tatanga's spaceship while dodging the war vessel's big cannonballs, which immediately split into three small cannonballs. After forty hits, the Pagosu is destroyed (and 5000 points are gained); however, the alien invader escapes. In the end, Mario rescues Princess Daisy and peace is returned to Sarasaland. Tatanga in a considerably weaker spaceship. Tatanga, known only as the "Alien" in preview material, reappears as a boss in Super Mario Land 2: 6 Golden Coins. Although his role in this game is not as significant, he does play a part. While Mario is distracted with Tatanga in Super Mario Land, Wario takes over Mario Land and occupies Mario's castle. After Mario defeats the alien invader, Tatanga flies to Wario's new castle. The spaceman is given one of the six golden coins needed to access Wario's Castle, and then sets up a base in the Space Zone. During Super Mario Land 2, Mario tracks down Tatanga, and the two fight for a second time. However, in this battle, Tatanga fights with a smaller space craft, capable of shooting energy weapons and dive bombing Mario. When he descends for his dive bomb attack, Mario must jump on top of the space invader. After three hits, Mario defeats Tatanga and recovers the golden coin of Space Zone. He can also be defeated with six fireballs. Like all the other bosses except Wario, Tatanga fell off the screen (his spaceship was destroyed as well, except instead of falling off the screen as he did, it simply disappeared) but not before crying about his loss. Ultimately, Mario uses the six golden coins to open the doors to his castle and kick Wario out. The fact that he is guarding one of the six coins at all hints that Tatanga has become Wario's servant, perhaps employed, or even hypnotized. The Mario character encyclopedia indicates Tatanga took the job to get revenge on Mario for ruining his scheme to marry Daisy. 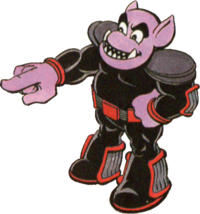 Unlike the other bosses featured in Super Mario Land 2: 6 Golden Coins, Tatanga does not appear in Nintendo Power's Mario vs. Wario comic, despite being perhaps the most major boss next to Wario, given his status as Super Mario Land's antagonist. Tatanga as he appeared in the comics. Tatanga appears as the villain in the Game Boy comic books spun off from the Nintendo Comics System, produced by the company Valiant. In the comics, Tatanga lives in an alternate dimension that exists within a Game Boy. However, the evil alien hypnotizes Herman Smirch, a human from New Jersey, causing the man to release Tatanga from the Game Boy. Upon arriving on Earth, Tatanga hopes to conquer the planet and rule it with an iron fist. Each time Tatanga is released, he always tries to conquer an Earth monument, such as Disney World or the World Trade Center. One time, Tatanga and his minions take over the Great Wall of China. However, Mario is always released from the Game Boy, and the hero inevitably brings the evil alien back to the Game Boy dimension. In the miniseries, Tatanga's relationship with Daisy is similar to the one between Princess Peach and Bowser, in that he appears to genuinely love the princess, with several of his attempted conquests being done solely in an attempt to impress her. Also in this series, he is considerably bigger and more muscular than in the games, has more pronounced fangs and claws, and wears a black uniform. His Pagosu is also able to assume a more humanoid form, making it resemble battle armor. 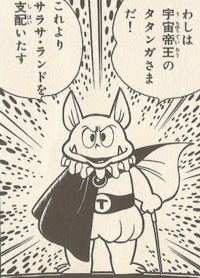 Tatanga appears in the Super Mario gag manga by Kodansha which depicts the events of the game. He is seen doing many of the things described in the manual such as: abducting Daisy, hypnotizing enemies, eating a Torion, and trying to make Daisy marry him. Tatanga later appears during a tennis tournament as Bowser's partner in the game. After his defeat by Mario's skypop, Tatanga applies for the job as Wario's henchman. When Wario casts a spell to make Daisy evil, Tatanga tries to marry Daisy again, and takes her to his home planet full of aliens like himself. However Mario breaks the spell leading to Daisy again rejecting Tatanga, leaving the alien conqueror reduced to tears. Tatanga is redesigned in the manga. He now has a frilled black uniform, a cape, batlike ears, and an entire mouth full of fangs. A recurring gag is for characters to be disappointed by Tatanga's short height. Tatanga makes an appearance in Super Smash Bros. Ultimate as a primary, advanced, defense-type spirit. Tatanga has not reappeared in games following Super Mario Land 2: 6 Golden Coins aside from a cameo in the "Astronaut" page of Super Mario Bros. & Friends: When I Grow Up. However, Tatanga is mentioned in Princess Daisy's bio in the game Mario Superstar Baseball and her trophy in Super Smash Bros. Melee and its sequel, Super Smash Bros. Brawl. He is later mentioned in Mario & Sonic at the London 2012 Olympic Games. ↑ "These Golden Coins are guarded by those under Wario's spell." Super Mario Land 2: 6 Golden Coins English manual, page 3. This page was last edited on December 24, 2018, at 14:48.